At this time of year, all I hear is “It’s too cold; it’s too windy’, it’s too snowy’ it’s too gray”. Time to change your mindset and look for the gold. 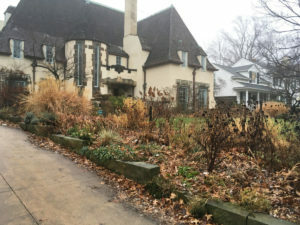 In early January, in the rain, I walked outside with camera to my front gardens where I photographed all of the images you see with this article. 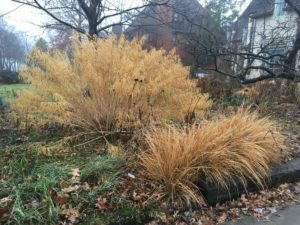 Most ornamental grasses turn beigey gold during late fall and retain that color throughout the winter. 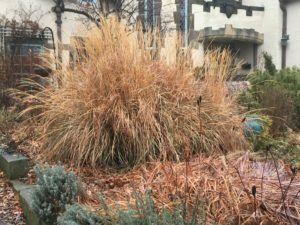 The exceptions are Schizchyrium scoparium (Little Bluestem) that turns copper and the blue grasses and sedges which never lose their color. The grasses in my photos are Miscanthus sinensis ‘Adagio’, Pennisetum alopecuroides ‘Hameln’, Molinia caerulea ‘Skyracer’, and Panicum virgatum ‘Rotstrahlbusch’. This assortment of grasses has a wide variety of heights, widths, and type of inflorescence. Although the Molinia flattens out early, the rest of the grasses remain fairly erect unless inundated by massive amounts of snow. 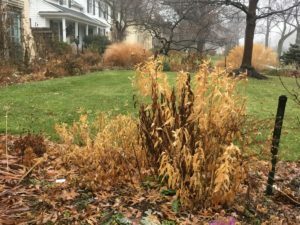 Even then, this Miscanthus rebounds as soon as the snow melts. The beauty of grasses interspersed in the landscape is the soft texture they add as well as their movement when the wind blows. 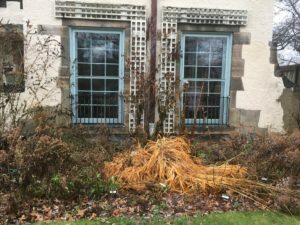 The main perennial in the photos is Amsonia. I have three different ones. One is an unnamed hybrid, another is A.’Blue Ice’ (a hybrid of A.tabernaemontana and an unknown species that is much more compact and produces darker blue flowers), and A.ciliata ’Halfway to Arkansas’, similar in appearance to A.hubrichtii. but with a fringe of hairs found on new leaves and plant stems. Although the foliage and flower color differ on these as they are different species, all turn to gold during mid to late fall. 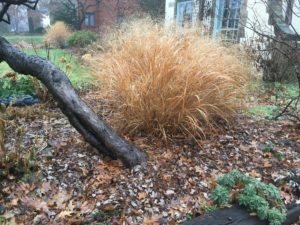 With the right plants in your landscape, no matter how gray the day, there’s gold “in them thar hills”.